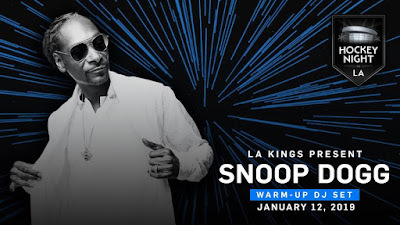 Multi-platinum artist, actor, philanthropist and entertainment icon Snoop Dogg will serve as the special Celebrity Guest of Honor for Hockey Night in LA on January 12 when the Los Angeles Kings host the Pittsburgh Penguins at STAPLES Center. Game time is 7:30 p.m.
DJ SNOOPADELIC aka Bigg Snoop Dogg on tha 1s & 2s will serve as a special in-arena DJ for the player warm-ups, which begin 30 minutes prior to the start of the game. Snoop Dogg will also drop the pre-game ceremonial puck at center ice with Kings captain Anze Kopitar and Penguins captain Sidney Crosby. Multi-platinum artist, actor, philanthropist and entertainment icon Snoop Dogg is at the forefront of popular culture with award-winning albums and songs, hit television shows, films, lifestyle products, philanthropic efforts and digital ventures. Snoop Dogg has reigned for more than two decades as an unparalleled musical force who has raised the bar as an entertainer and globally recognized innovator. Since 1993, Snoop Dogg has released 18 studio albums and sold more than 35 million albums worldwide, reached No. 1 on Billboard charts and received nearly 20 GRAMMY® nominations. A multi-faceted entertainer, Snoop performs worldwide as a DJ under the name DJ Snoopadelic, where he has been tearing up festivals and clubs around the world for years. DJ Snoopadelic was the first hip hop performer to secure a Las Vegas residency. In November the Kings, in conjunction with FOX Sports West, launched Hockey Night in LA, a series of special weekend games in which the club’s broadcasts and activations in and around STAPLES Center have a different silver-themed feel, including celebrity guests, debate-themed programming and outdoor fan fests featuring live music acts. Hockey Night in LA kicked-off on November 3 with actor Eric Stonestreet, the co-star of Modern Family, as the special guest star. In subsequent Saturdays the Kings and FOX Sports West have featured Curb Your Enthusiasm co-star Jeff Garlin; KROQ’s Kevin Ryder; and hockey pioneer/Hall of Famer Willie O’Ree as the Celebrity Guest of Honor.